Now for something a little different, and the pun was intended. 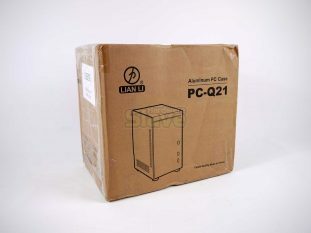 We have had the pleasure of a Lian Li chassis before, the PC-V1000 and it was amazing. This was in the day when you still had beige boxes and desktop chassis, where are they now? There has been a significant increase in mITX chassis and Lian Li have designed and released several examples in their usual style, and very much like the Lian Li PC-V1000. These days, PC components are reaching a certain maturity and whereas in yesteryear only office grade mITX motherboards were manufactured, so if you wanted something a bit special, and maybe run some games on a small system, you could only manage Solitaire. Now with the fantastic range of mITX gaming focused little motherboards, small builds are a very viable proposition, and they will not make you blush at a LAN party. Today we are reviewing the Lian Li PC-Q21, a small and very good looking mITX chassis, and with the gaming focused mITX components out there, let’s review this little mITX contender and see if we can’t get a gaming rig out of it too. If you follow Lian Li, this is all very familiar and welcome, just reminds us of the excellent PC-V1000. It is a very clean and light chassis, you also get this in black, but the aluminium suits us just fine.